7000 BC members will be a part of the Local Comics Pop-Up at Big Adventure Comics at 418 Montezuma, Suite C (in the Jean Cocteau building, across from Sanbusco) in Santa Fe on Saturday, February 23 starting at 1:00. New Mexico-based writers and artists will be selling their creator-owned books and talking about how they work. At 2:00, Turner Mark-Jacobs gives a 30-minute demonstration about his art and process. This is a great opportunity to support local talent and to connect with people making comics. 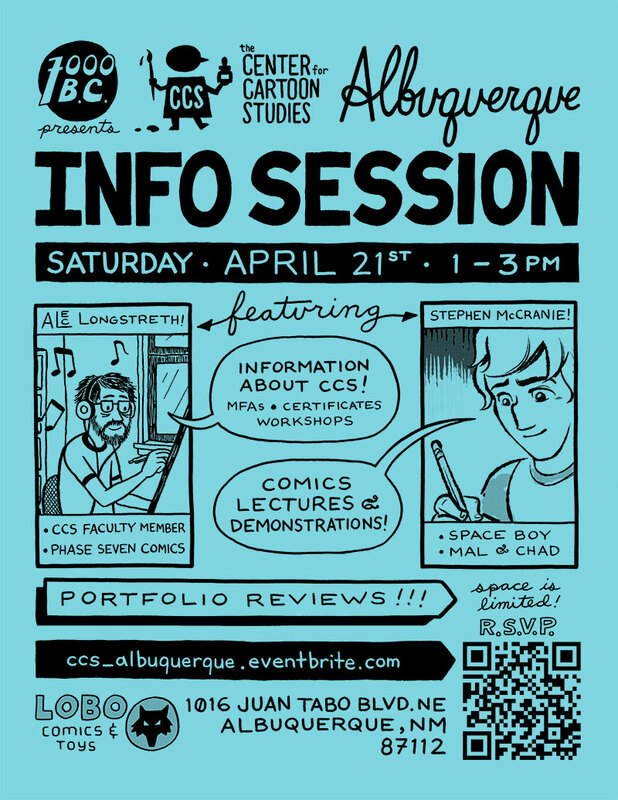 7000 BC is happy to bring The Center for Cartoon Studies to Albuquerque. This event offers the opportunity to learn more about the school’s MFA, certificates and workshops from cartoonist Alec Longstreth. He will also offer portfolio reviews with Stephen McCranie. CCS’ mission is to provide the highest quality of education to students interested in creating visual stories. CCS’s curriculum of art, graphic design, and literature reflect the wide array of skills needed to create comics and graphic novels. CCS emphasizes self-publishing and prepares its students to publish, market, and disseminate their work. This is also your chance to meet the comics creators of 7000 BC and connect with locals writing and drawing comics. The event at Lobo Anime & Comics is free, but R.S.V.P here. 7000 BC members will be a part of the Local Comics Pop-Up at Big Adventure Comics at 418 Montezuma, Suite C (in the Jean Cocteau building, across from Sanbusco) in Santa Fe on Saturday, March 24 starting at 1:00. New Mexico-based writers and artists will be selling their creator-owned books and talking about how they work. It will also be 7000 BC’s March meeting, there will be business conducted later in the afternoon. For the first 7000 BC meeting of 2018, we’ll be at Lobo Anime & Comics at 1016 Juan Tabo Blvd. NE in Albuquerque from 1:00-4:00. Everyone interested in making comics is welcome, send an email with any questions. Be a part of 24 Hour Comics Day 2017 — accept the challenge to create 24 comic book pages in 24 consecutive hours. Join 7000 BC as the sun sets and rises at Twin Suns Comics and Games for a creative exercise that will test your stamina while you explore what you’re capable of. Once again thousands of artists of all skill levels from around the globe gather for this annual celebration of comics creation — Albuquerque has consistently been among the largest gatherings in the world for this international event, so bring your papers and pens, enjoy coffee from Winning Coffee, and join in for New Mexico’s only 24 Hour Comics Day event. This event is open to all ages (with parental permission for minors) and is free. Pre-registration is not required, but it’s helpful — if you know you’re going to participate, please send an email. We’re also looking for sponsors to donate food, drink, and prizes. Please get in touch if you’re able to donate or help us find donations. 7000 BC will again host a 24 Hour Comics Day in Albuquerque — this year at Twin Suns at 6301 Riverside Plaza NW Ste L-1. 24-Hour Comics Day is an annual international celebration of comics creation. On this day, creative folks take on the 24 hour comics challenge: to create a 24 page comic book story, normally months worth of work, in 24 straight hours. All are invited to participate for the complete time, or as much as they are able. Minors are welcome with parental permission. We’re not requiring pre-registration, but it’s helpful — if you know you’re going to participate, please send an email. 7000 BC members will be a part of the independent comics sale at Big Adventure Comics in Santa Fe on Saturday, June 11 starting at 1:00. New Mexico-based writers and artists will be selling their creator-owned books and talking about how they work. This is a great opportunity to support local talent and to connect with people making comics in New Mexico. Local creators, if you’re interested in a free table, send an email. It will also be 7000 BC’s June meeting, there will be business conducted later in the afternoon. 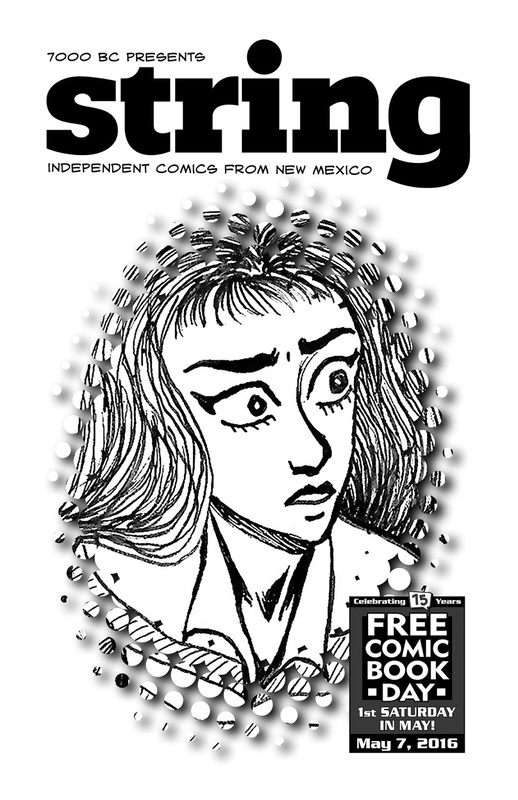 7000 BC’s annual free ashcan sampler of independent comics from New Mexico is now available for download. 7000 BC members will be a part of the independent comics sale at Big Adventure Comics in Santa Fe on Saturday, April 9 starting at 1:00. New Mexico-based writers and artists will be selling their creator-owned books and talking about how they work. Big Adventure Comics has commissioned a Star Wars’ Rey drawing from Michael Ellis — raffle tickets are free, one per customer, available when the store opens. The raffle will take place at the end of the event, at 4:00, and the winner must be present. It will also be 7000 BC’s April meeting, there will be business conducted later in the afternoon. 7000 BC members will be a part of the independent comics sale at Big Adventure Comics in Santa Fe on Saturday, December 12 starting at 1:00. New Mexico-based writers and artists will be selling their creator-owned books and talking about how they work. It will also be 7000 BC’s December meeting, there will be business conducted later in the afternoon.